From bow ties and shoelaces to sailing boats and climbing ropes, knots are not only very useful for our daily lives, but for mathematics too. IBS researchers from the Center for Geometry and Physics, within the Institute for Basic Science (IBS) reported a new mathematical operation to catalog a special kind of mathematical knots, known as Legendrian singular knots. Their study, accepted by the Journal of Symplectic Geometry, deals with knots that go well beyond the annoying entanglement of headphone wires. Making perfect knots on ties and quick knots on shoes are good skills to have, but why are mathematicians so interested in knots? It turns out that beyond being an intriguing mathematical curiosity, knots are also at the root of understanding our universe. 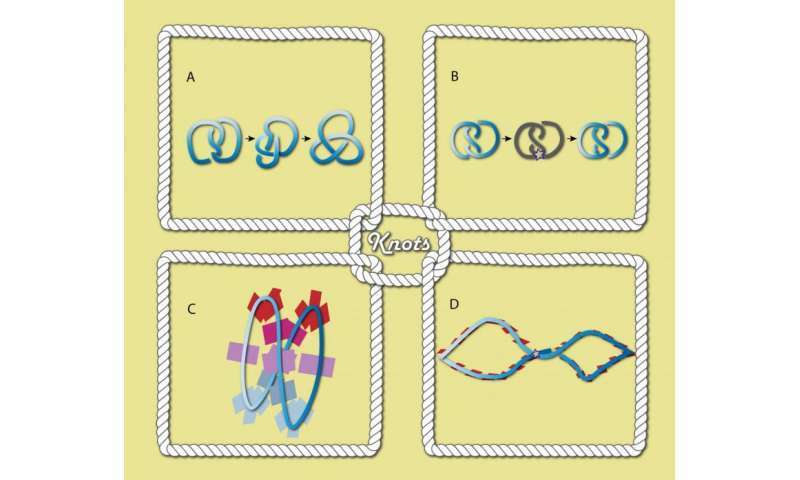 Interestingly, classifying knots is crucial to study complex 3-D spaces, like our universe. "No one has circumnavigated the universe, like Magellan did on Earth, so we don't know its shape. Space travel aside, mathematicians are investigating knots to provide a tentative list of all the possible shapes of the universe," explains KIM Seonhwa, one of the authors of the study. His colleague HEE An Byung adds: "There could be an uncountably infinite number of possible 3-D spaces. At the moment, the shape of some patches of our universe are clarified, but we miss the overall structure, that's where knot theory can help us." For decades, mathematicians have been looking for rigorous proofs to distinguish and classify knots. In mathematics, different looking knots are actually equivalent if they can be derived from each other without having to cut the rope. Several rules for differentiating knots are available, but for this study, IBS mathematicians focused on a special type of knots, called Legendrian singular knots (LSKs), which are much harder to classify. LSKs belong to a branch of mathematics known as symplectic geometry, which is one of the most important fields in modern mathematics and physics. The research team devised a new operation, called 'singular connected sum', to investigate and distinguish LSKs. As applicable rules to classify other types of knots, namely Legendrian knots and singular knots, do not work with LSKs, this study represents an important step forward in knot theory. "It looked like there was a huge number of possible situations, making LSKs very hard to classify. Thanks to this new operation and its properties, we demonstrated the number of possibilities is not as horrible as it looked. Furthermore, we made an example which shows that LSKs are more than the combination of Legendrian knots and singular knots," points out BAE Youngjin, another mathematician involved in the study. The study is the result of a collaboration among three researchers involved with different fields of mathematics. This fits in the spirit of the Center for Geometry and Physics, which encourages the blending of different lines of research. A deeper analysis of the singular connected sum operation is already underway. It aims to explore even more elaborate objects of symplectic geometry; the Legendrian spatial graphs, and hopefully help us to understand the fascinating possibilities of 3-D spaces, including our universe.